The Moggill Pet Motel also includes the "Pet Pamper Parlour" for your pets grooming needs. 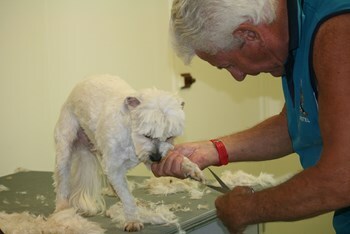 Our professional groomers can fluff, puff and pamper your pet to make them look, feel and smell great. From summer clips to winter tidy up or just a bath and blowdry. As each animal is an individual, price is on application. We now offer a fortnightly hydro bath service in the local area. Talk to us about this unique service.